Today I came to understand why guys stand around looking under the hood of a car doing nothing. You have to wait for the engine to cool down before you try to fix it. Then you have to wait to see if the fix worked. Then you have to wait some more for good measure. Back in San Francisco after the 700-mile mark, the BGT took a quart of oil and she was still low. Googie suspected something might be amiss. In Felton, we stopped at the local NAPA store and bought eight quarts. She drank two more that day. 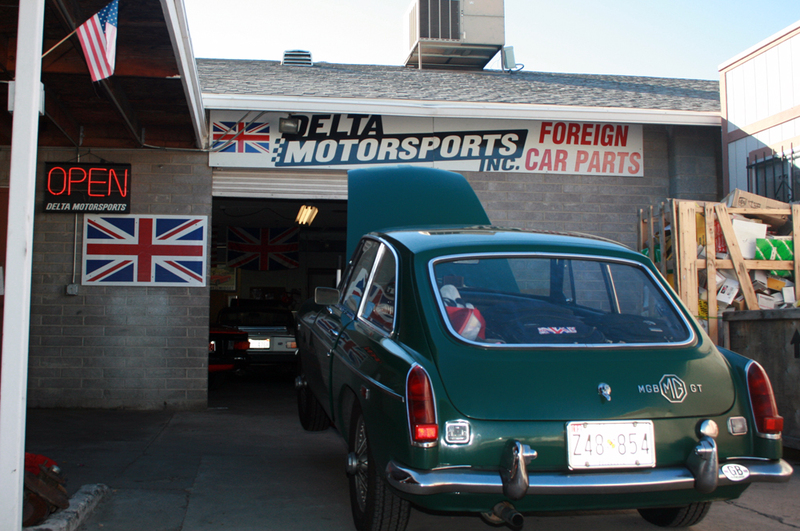 Over the course of the next two days, there were texts and phone calls back to Chad at British Motor Care in Portland — the MG doctor hotline. Our little girl started drinking oil much too quickly. We had to restock our supply on the highway and weren’t always able to find the oil of choice — Castrol. By the time we rolled into Phoenix, she was taking a quart every 100 miles. Clearly, an intervention was needed. That night Googie narrowed down the possible leak suspects. One, he told me, was a quick fix. And one was going to leave us in Phoenix for Christmas. I wanted it to be that first problem. 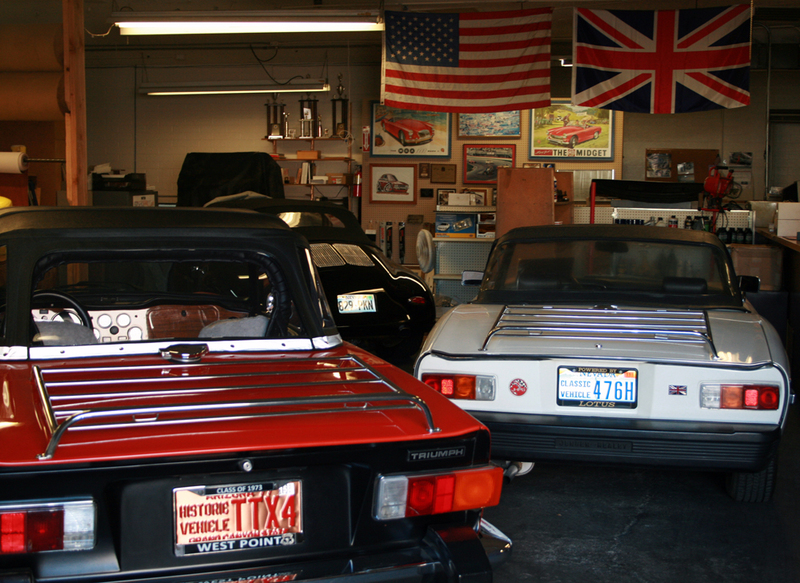 In the morning, Googie Googled British car care services in Phoenix. With one phone call we were sent to the expert, Mike Dolimpio of Delta Motor Sports. Mike quickly confirmed Googie’s diagnosis of the problem. I was in luck, it was the quick fix. He put our girl up on jacks and swapped out a pinched “O” ring between the oil filter assembly and the block using a Moss Motors part, of course, which he had in stock ($1.50). The faulty “O” ring had probably been improperly installed long before we bought the car. The rough ride on Route 66 may have caused the bolt that holds the oil filter assembly to the block to shake loose. The “O” ring may have taken us all the way home otherwise. While Mike worked on the car, I worked on yesterday’s post seated next to the sewing machine at the upholstery station in Mike’s shop. Googie reported in to Chad on the repair and after a mere hour and a half, we were back on the road. It turns out that Chad and Mike know each other. Each of them is a stop on the MG Underground Railroad. The day’s traveling magnificence was brought to us in Tucson. The Sagauros elicit the same sense of awe as the Redwoods. 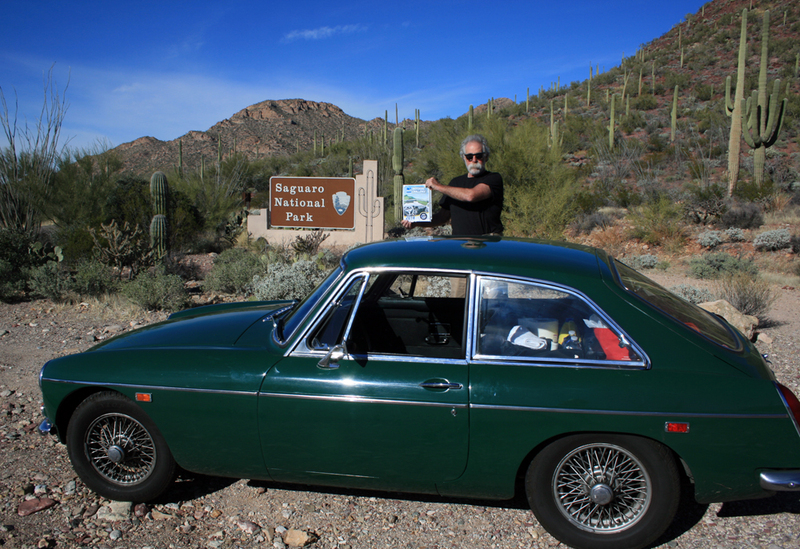 We picked up our first National Park point for the Moss Motoring Challenge. We took a winding climb through the hills. Then back on I-10, past Council Rocks, through New Mexico and into Texas. The stats on the day: 501.9 miles, no oil needed. Glad to hear the fix was a “no brainer”. What at trip, we are excited for you….. The Prince of Darkness is an urban myth created by AC Delco. 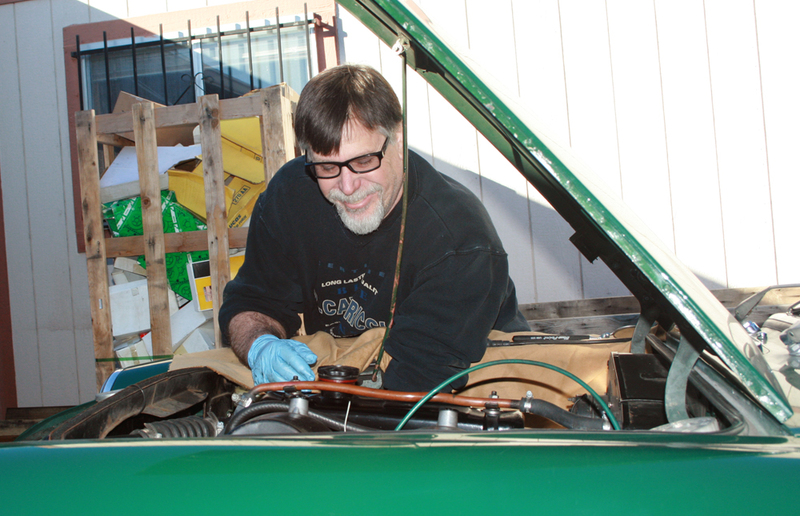 Lew, on second thought…because you put so much oil through the pistons/ cylinders…it would be prudent to run a can of SeaFoam through the gas tank. It would burn off any accumulated oil/carbon deposits…just saying. The oil was going in the top and coming out the bottom so fast it never spent any time in the engine. I would have preferred to see the oil consumption keep up as it might have helped to firm up crude oil prices. We left a lot of Texas oil on the Arizona blacktop. I’m impressed with that driving mechanic man “Lew”. Glad the Quick Fix was it! Christmas is nearly over, steady on the road. Credits to the navigator too, good reporting! Have lots of fun ! Reporting at 75 mph is easier than you might think. That Verizon coverage map is pretty accurate. Nice VistaVision video – could you pan over next time and show the driver in action? Still don’t quite understand where all that oil was exiting the engine. The undercarriage must look like the La Brea tar pits. BTW – Merry Christmas road warriors! Not only is she carrying a fresh coat of oil on her undercarriage, she has acquired a well-earned patina which she will continue to gather until her scheduled spa services in Jacksonville. Glad the fix was a minor one. You can be sure the undercarriage is well oiled and will not rust.